Are you ready for heroic deeds that win you fame, wealth and the hearts of beautiful maidens? Well, then go and play another game! This one is for people who want to know what it takes to build and run a dungeon. Where to get all those minions and monsters, and how to keep them satisfied. And how it feels when some band of do-gooders try to ruin all that work! Are you ready for this challenge? 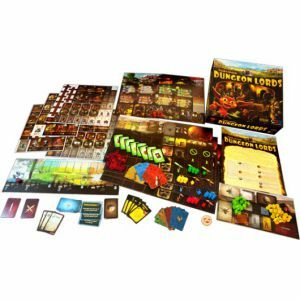 Dungeon Lords is a game for 2 to 4 aspiring Dungeon Lords. You get to dig tunnels, mine gold, hire monsters, create traps and care about all the things a proper dungeon needs. It is not easy, as the competition for resources is stiff and sometimes you have to get a bit evil to get what you want - and the more evil you get, the stronger the adventurers your dungeon attracts. 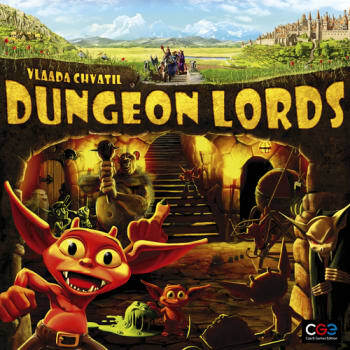 Twice a game, these adventurers set off to conquer your dungeon. Command your monsters and use your traps to stop them, before they do too much damage. In the end, you score based on your achievements: constructing and defending your dungeon, and perhaps winning some prestigious titles.